According to a BBC news site item, girls as young as nine years old are being married to older men in northern Afghanistan in exchange for food and other goods. 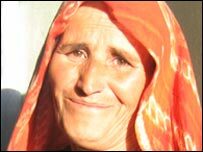 Badakhshan's independent MP Fauzia Kofi says she has seen an increasing number of such child brides in the last two years. "I don't call it marriage, I call it selling children," she says. "A nine or 10-year-old - you give her away for wheat and two cows." The reason given for this atrocious use of female children is poverty. Government officials say the situation will not soon change because Afghanistan is a poor country, and Badakhshan is its poorest province. But, I don't think it's poverty. Poverty may be the environment in which the family choosing to do this to their girl children makes the choice. But, it's not just poverty. It's the valuing of women and children that makes them choose to sell the child into sexual, reproductive, and labor slavery. And, slavery is what it is. These girls will live or die by their reproductive organs. A midwife in the village of Khordakhan, Hanufa Mah, says she tries to teach parents not to marry their girls too young but some feel they have no choice. One girl she helped through labour was only 10 years old. UN figures show that more women die in childbirth in Badakhshan than anywhere else in the world, and mothers under the age of 15 are most at risk. The girls of Afghanistan are being sold and made to have babies because of their religious and cultural background as well as because of poverty. What can you do to help those girls and others like them around the world? I've checked back a few times to read around in the blog I referenced earlier as displaying religious hate of women among Christian fundamentalist traditionalists. I was reminded again of an attitude among them, one that most women would not believe, because it is too chilling. That belief, clearly held, is that women are the property of their husbands. Now, that may not sound chilling at all to some women, who are encouraged to romanticize it into a sort of Tarzan and Barbie kind of relationship. But, I'm not talking about being swept away by a big guy in a pirate shirt with long flowing blonde hair and bulging muscles, the kind on the cover of Romance fiction books. I'm not talking about that at all. I'm talking about men who regard females as literally having been created for males' use. And, in particular their use in reproduction. These men see women as possessing wombs (they prefer "womb" to "uterus") that are there for men to use. A man gets a woman so he can use her uterus, which belongs to him for his use. That's what she's for, and what it's for. It's for him to use to create children for his governance, as the subjects in his own personal kingdom. They make no apology for it either, and do not want to be called "complementarians" or "traditionalists" because they regard themselves as "patriarchs" believing in the superiority of what they think of as the God ordained government model of patriarchy. And they define patriarchy as "father rule." Fundamentalist Christian patriarchicalists aren't the only ones who regard women as wombs to be owned by males. Fundamentalist Mormons do too, as do males of certain other religious groups. What happens to women who are basically reproducers, cows, if you will? They are sequestered, because other men must not get access to the male owner's womb. They are restricted, because they must be controlled by the male who owns their womb. They are impregnated, whether they want to be or not, because the male owns rights to their womb. They are victimized, because they are not regarded as whole people, but as womb carriers. They are without voice, because their owners speak for them. They are without power, because they are dependent on their owners. They are abused, because they do not have ownership of their bodies, nor a way to protect themselves or their children. By their husbands, because they are primarily providers of a service. By their religious group, because they are owned by the males in the group. By their government, because they are not whole people, they are providers of wombs for male use. By their family, because if it is determined that an unapproved person might get access to their womb, they can be killed to protect the family's "honor." Or, they are simply the lesser parent, or the daughter who will be given over to someone else's ownership when she marries. As owned property, they are in particular danger in time of war.